"Follow Me." Jesus calls Philip. Jesus is increasing; John the Baptizer is decreasing. The Lord seeks out Philip to follow Him as one of His disciples. The normal process was for men to seek out a rabbi that they admired and agreed with, and followed him. They would choose the teacher. But Jesus turns that all on its head. The Lord shows that you do not choose Him; He chooses you. You cannot decide to follow Jesus, or "make" Him your Lord and Savior. He calls you, gathers you, enlightens you, and makes you holy, all by the work of His Spirit. Here He selects Philip, and immediately the Spirit has Philip get Nathanael. You can practically hear the excitement in Philip's voice, "We have found Him of whom Moses in the Law and also the prophets wrote!" We have found the Christ! St. Philip is even more excited than Lumiere, Cogsworth, and all the servants who speculate that finally, Belle will be the girl who can break the spell and return the Beast to his princely self. But Nathanael is not so easily impressed. "Nazareth!? Can anything good come from Nazareth?!" That little village of backwater hicks? You have got to be kidding me! Nazareth was not exactly known as a center of religious life, nor did it have a reputation as a great place to be from or move to. It was a simple, rural village. But Jesus speaks to the self-important Nathanael. He reveals Himself as the Christ who has come, not only for the Jews in Judea, but those living in culturally mixed territories, like Galilee. And in fact, He reveals that He is come for all people, Jew and Gentile alike. The Word of God issues from His mouth of the Word of God. And that Word is a Word of forgiveness and life through the crucifixion and resurrection of "Him of whom Moses in the Law and also the prophets wrote." Yes, that is right. You just heard Nathanael referred to as "self-important." And you know what? You have a problem with that sin too. You may look to other churches' fashionable buildings, charismatic speakers, and flashy antics, and think you know better than the Lord at this place. You may want to place your trust and interest in the plans and demographics and research of the world, but the Lord knows better. You may just think you are too good for this parish, this neighborhood even, and decide you must move on. Or even worse, you may find your own thoughts tempted and swayed by the false teaching that says, "no matter what you believe, we are all going to the same place." Not those who have rejected Christ. Not those who have turned their backs on "Him of whom Moses in the Law and also the prophets wrote." If you start imagining yourself to be smarter, savvier, and more "in tune" to things than Jesus, you have a major problem. And if you are pulled away from the truth of Jesus Christ, and you believe the lies taught by those who are against Him, and are comfortable and do not want to change and repent, you are not just someone sitting under a tree, you are lost. "I saw you sitting under the fig tree." A little strange, you may think. Nathanel too. Was he amazed or just didn't know what to make of that? We don't know what was running through his mind. But Jesus uses the moment to be sure he knows the best is yet to come. He tells him, "You will see greater things than this." Indeed. For Nathanael's and your sake, "the One of whom Moses in the Law and also the prophets wrote" became Man. The Lord God showed Himself as a Man, baptizing your sin onto Himself and releasing you from it. He covered you with His righteousness. And than the greater things started happening. Yes, the miracles, the healings, and even the several people Jesus raised from the dead. But then the suffering and crucifixion, and His glorious resurrection! Christ the Lord rises, appears to many, and then ascends to heaven. Nathanael saw greater things. Nathanael is referred to by another name elsewhere in the Gospels: Bartholomew. Like the other apostles, Bartholomew preached and taught and baptized, carrying Christ's Gospel around the world. The Spirit completely convinced him that this Jesus of Nazareth was more than some hick preacher. Bartholomew proclaimed Him as who He is: "the One of whom Moses in the Law and also the prophets wrote" -- God with us! Tradition tells us that St. Bartholomew preached boldly until he was killed for it. He was literally skinned alive for preaching Jesus. This apostle, due to the saving work of Jesus, was no longer a doubter, but was forgiven and renewed, and made a true Israelite in whom there is no deceit. 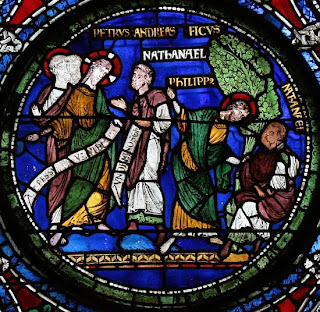 Like Philip, Nathanael Bartholomew followed Jesus, right up to dying for preaching the truth of God. He was faithful unto death, rather than trying to "save his skin" and deny the Lord. "Follow Me." Whether you see Jesus in His splendid robes and crowned, returning in glory as Christ the King, or the Christ Child wrapped in swaddling cloths, lying in a manger, or you see the humble, suffering Jesus enduring it all to pay for your sin, or Jesus preaching to you, baptizing, and feeding you through your pastor, He bids you to follow Him. And since the Holy Spirit has baptized you and brought you to faith, you do. You follow Him to life everlasting! Amen. Are They Afraid of Love? of Family?